[/dropcap]he affluent Upper East Side, home to Madonna’s 40 million dollar compound on 81st, Grace Kelley’s former residence – now the Manhattan House on 66th and don’t forget Carrie Bradshaw’s famous walk-up – is one of our favorite New York City neighborhoods. With it’s tree lined streets and concrete steps leading to countless brownstones, you’ll feel like you’ve been transported back to simpler times. But once night falls, the Upper East Side is a lively extravaganza of food and entertainment certain to please even the most discerning palates. This week – let’s take a look at our featured bar – The ABV Wine Bar. 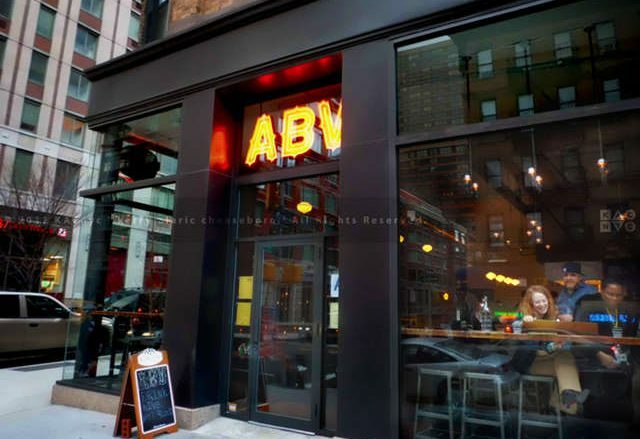 ABV (which stands for Alcohol By Volume) Wine Bar is home to some of Corey Corva’s (Earl’s Beer and Cheese) forever favorites. Start your evening right with one of their many wines on tap, or celebrate an exhausting travel day with a glass of Sparkling Wine. Don’t get too lost in ABV’s copious wine and alcohol list we guarantee every selection is a winner. ABV Wine Bar serves a scrumptious weekend brunch – including their fluffy yet sinfully sweet Brioche French Toast. And for dinner, be sure and try their famous Foie Fras Flutternutter. This season they’ve added a delightful seared duck liver laid out on of all things Wonder Bread to their menu. And for those hot sticky Manhattan afternoons, don’t miss their signature Grapefruit Ice Cream. ABV Wine Bar is open Sunday – Thursday 5pm – 12am & Friday & Saturday 5pm – 1am, with a weekend brunch every Saturday and Sunday from 11am – 3pm. This post is part of OnBoard’s Guide To NYC: The Upper Eastside Edition.